It's Facebook Fridays! for November 20, 2015, and we want to make this your lucky day for love! 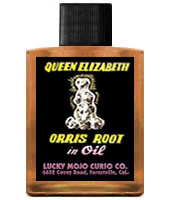 The Lucky Mojo Curio Company is providing a random drawing to give away 3 great Queen Elizabeth Root spiritual supply prizes, for love, luck, and passion. 3 lucky winners will get a Queen Elizabeth Root Power Pack, complete with Dressing Oil, Sachet Powders, Incense Powders, and Bath Crystals. First thing tomorrow morning, we will select THREE winners at random, announce their names here, and ask them to message this Facebook Page with their mailing addresses, so we can send them their FREE Queen Elizabeth Root products. Get on over to Facebook and enter the contest, folks! It ends omorrow morning! We have a winner! In fact, we have 3 lucky winners! Our Facebook Fridays! winners for November 20, 2015 are: Sharice J. Styles, Glory Quiett, and Ilyssa Baine. Congratulations, folks! If you are one of our winners, please contact this Facebook page by clicking 'Message' above and send us your mailing address for shipping purposes.